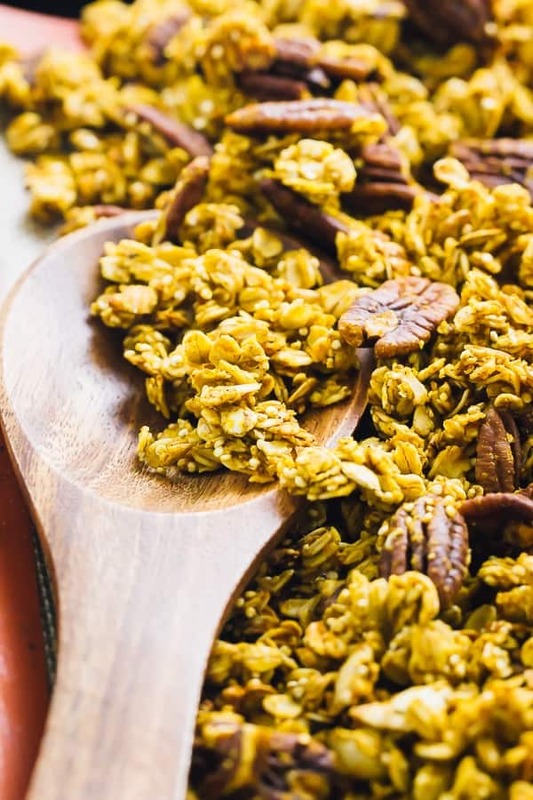 This Healthy Pumpkin Spice Granola is loaded with delicious fall flavours, made with easy ingredients and takes only 10 minutes of prep to make! Did you see that above video?! Every time I watched it while editing, I snuck an extra bite of this healthy pumpkin spice granola. 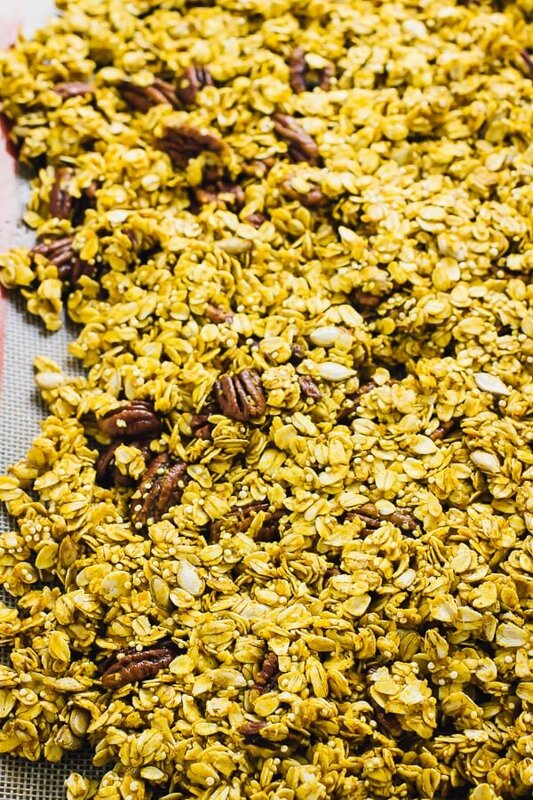 Remembering how this beautiful granola recipe was made was the only excuse I needed to keep eating it. 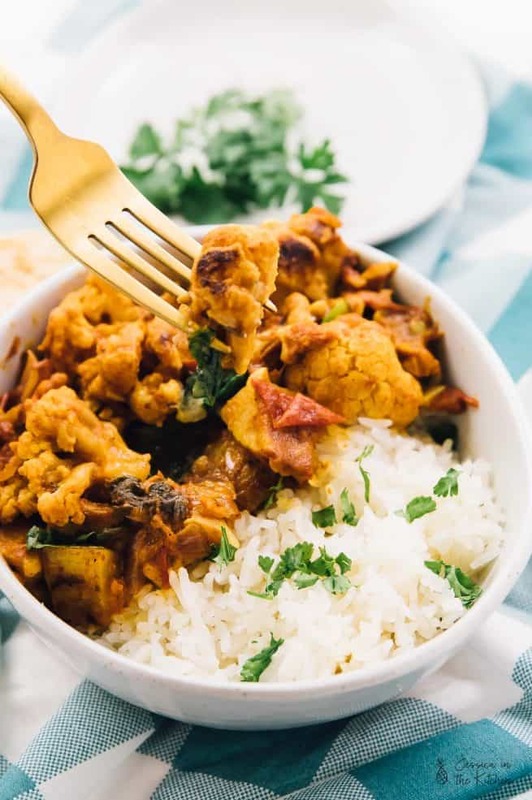 This is definitely one recipe you need to make because not only is it easy and delicious, it’s loads with protein, and so much pumpkin flavour. Pumpkin flavour = all the fall, my friends. 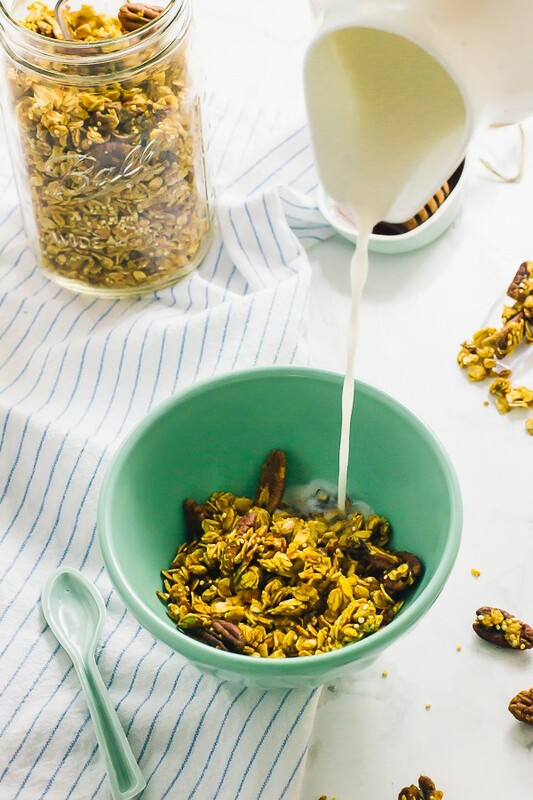 Let me take you into the story of this healthy pumpkin spice granola. Cue me loading up on literally, 5 pounds of pecans. No, it still isn’t finished yet despite me making like 5 pecan recipes this month. After eating ALL the pecans in ALL the things, I rummaged around my pantry looking for my favourite granola. All done – oh that’s right, I finished it all. Immediate thought: I need granola. I need to MAKE granola. Now, after needing a granola that tasted similar to my favourite organic granola, I knew which ingredients I needed: quinoa, oats, spices, seeds, and sweetener. I decided to throw in the pecans after toasting them in my pecan butter recipe. Then, because I have an insane amount of homemade pumpkin puree in my house, I knew pumpkin needed to be added in. Not just pumpkin spice, but real pumpkin. At this point I realised, this could be TOTALLY delicious or terrible. Turned out to be totally delicious. 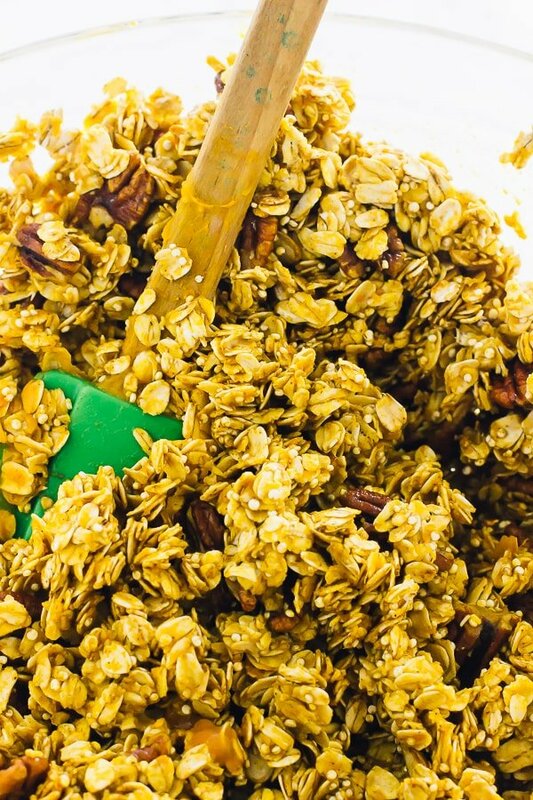 The pumpkin adds SO much depth of flavour to the healthy pumpkin spice granola. 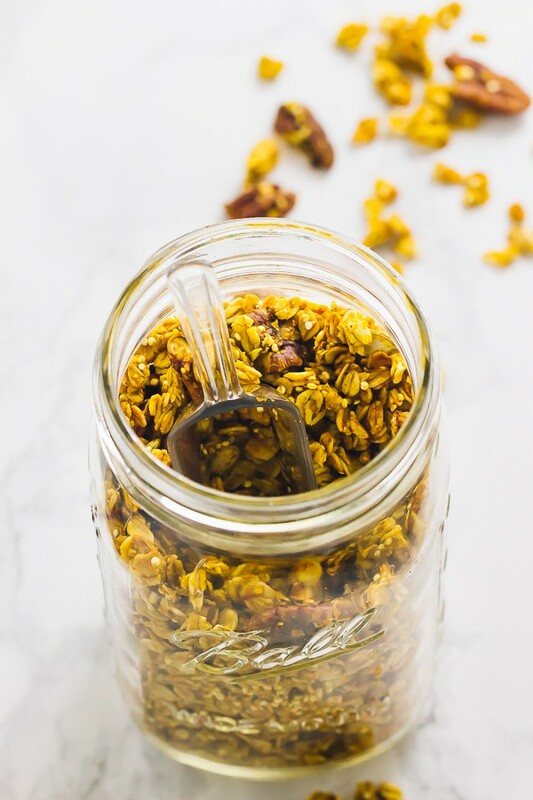 Combined with the maple syrup, coconut oil, and everything else it also adds a delicious amount of crunch to the granola. 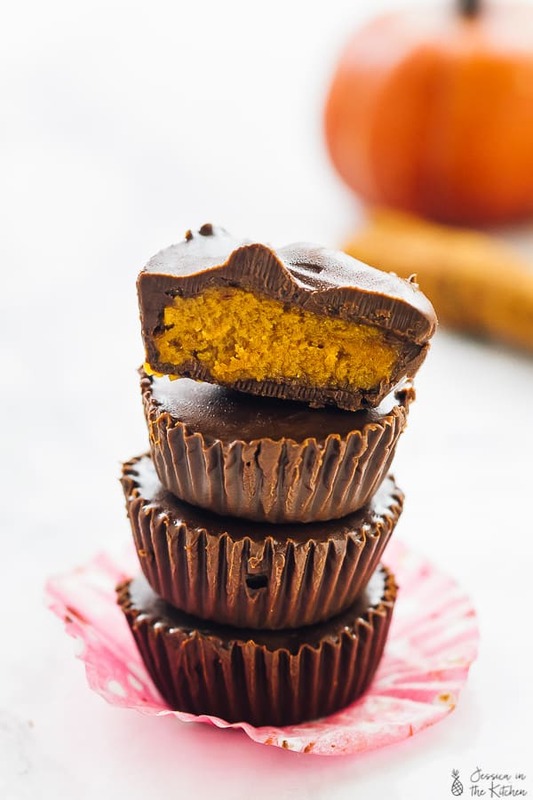 While I loved the crunch here, if you want more, you can always use a little less pumpkin puree (¼ cup) for even more crunch. Speaking of crunch, crucial point. It’s going to be SO tempting to dig right into the granola after it comes out. DON’T. Leave it until cooled. I know, but it’s so worth it. It helps the granola to crisp up even more and it helps with its “clump factor”. Anyway, be sure to make this and put it on everything. So far: breakfast with milk (definitely had way too much – oops), on ice cream, on Cinnamon Baked Pears. Also, on anything sweet and creamy I can get my hands on. P.S. to make this even better, throw in some dried cranberries and chocolate chips after it’s been cooled. Oh my. That’s a must the next time I make it. 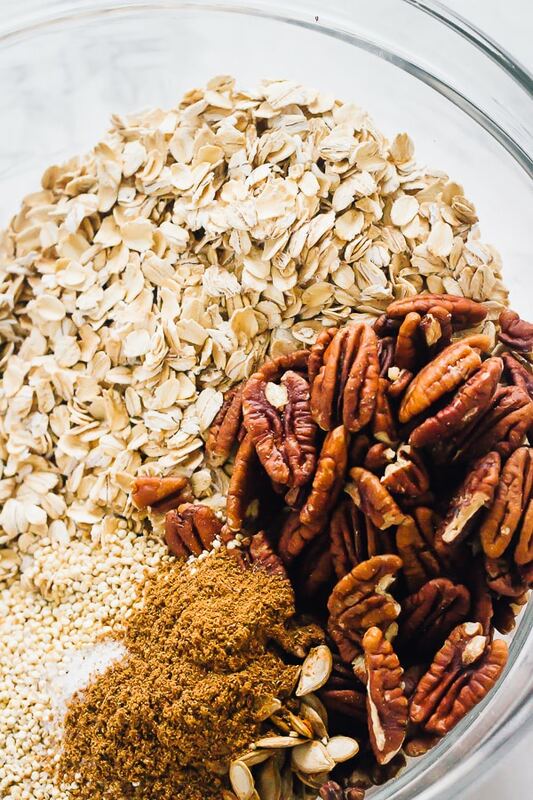 If you try this Healthy Pumpkin Spice Granola please let me know in the comment section below, or tag me on instagram with the hashtag #jessicainthekitchen! For more exclusive recipes follow me on Instagram AND on Snapchat: jessinkitchen. Preheat oven to 350 degrees Fahrenheit. Line two baking sheets with parchment paper or silicone mats. If you don't have two, you can do one set at a time. Stir all the wet ingredients together. Pour into the dry ingredients and stir with a wooden spoon until combined. Spread the mixture onto two baking sheets, ensuring that the granola is completely flat and in a single layer as much as possible. Bake for 25 minutes, stirring mixture halfway. At 20 minutes check to ensure that it isn't burning. Remove from oven and let cool COMPLETELY before touching to ensure it's crunchy. When cooled, remove and enjoy immediately, or store in an airtight jar for up to a few weeks. 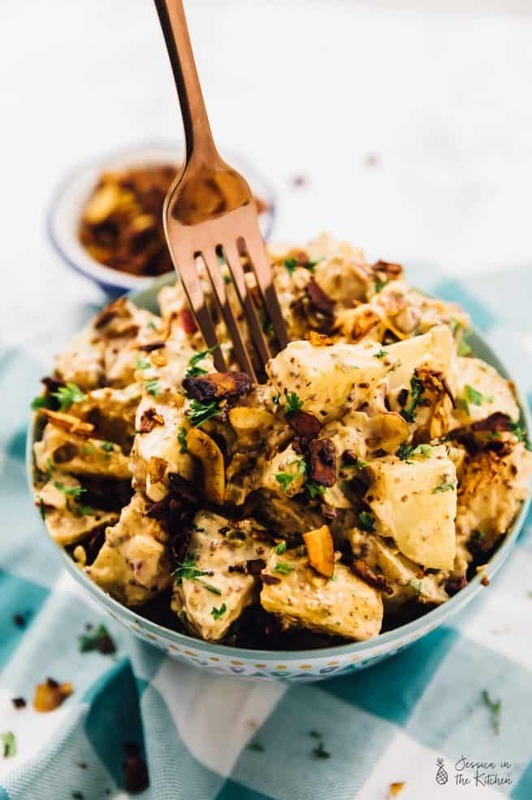 You can add in chocolate chips or even white chocolate chips, cranberries after it’s been cooled if you’d love to amp up this recipe even more. Feel free to use walnuts instead of pecans and different seeds in this recipe. You can also add coconut at the halfway mark when stirring in. I couldn’t stop eating them whenever I had some homemade granola..that’s why I haven’t baked some in a while and now this one have me crave some again! Gorgeous golden colour and wonderful autumnal flavour! Thanks Angie!! Same here haha! OOOOOOOOOOOOO this looks fantastic!!! i have yet to come across a pumpkin granola recipe, so GOOD WORK! haha. and pecans are so amazing, 5 lbs sounds like a great purchase to me. Pinning! I love homemade granola! This pumpkin spice version sounds amazing!!! Looks like all the goodness has come together in this recipe. Hi there, Your recipes sound delicious. :-) As I’m plant based and everything free just about, I’d like to try your granola recipe because it’s got pumpkin in it. How innovative! However, as a Brit – ‘pumpkin spice’ – er ??? I will also assume that the pumpkin puree has been made from roasted pumpkin (without any additions), parsed through a sieve or blended…? I’m making for me only as my family are all away at the moment so any help would be greatly appreciated. I look forward to trying this. Thanks so much for your comment! Pumpkin spice is a combo of many spices yes, but you could just 1 teaspoon cinnamon, and a mix of nutmeg, all spice, ginger, and ground cloves for the other teaspoon. I also made a post on how to make pumpkin puree, which I’m adding a video to this Saturday: https://jessicainthekitchen.com/how-to-make-pumpkin-puree/ . Yes, all natural and blended! I hope that helps! If you have any more questions, let me know!